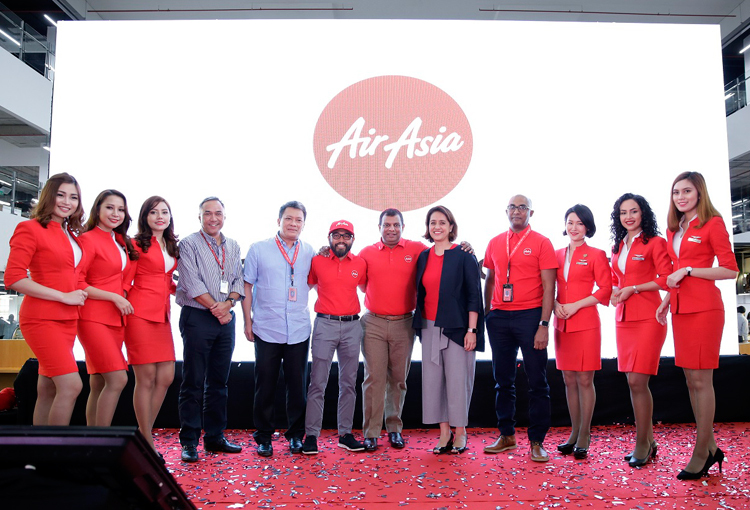 (Fourth from left to right): Captain Adrian Jenkins, Chief Operations Officer of AirAsia; Rozman Omar, Executive Director of AirAsia International Limited (AAIL); Riad Asmat, CEO of AirAsia Berhad; Tan Sri Tony Fernandes, Group CEO of AirAsia; Aireen Omar, Deputy Group CEO of AirAsia – Digital Transformation & Corporate Services; and Bo Lingam, Deputy Group CEO of AirAsia (Airline Business) at the AirAsia Special Announcement event today. Aireen Omar, the current Chief Executive Officer of AirAsia Berhad, will be promoted to Deputy Group CEO – Digital, Transformation, Corporate Services. Aireen's appointment signals AirAsia's determination to successfully transform itself from an aviation company into a digital corporation. This appointment underlines as well the fact that AirAsia is restructuring its priorities to optimally maximise the enormous potential of the Fourth Industrial Revolution. Digital transformation will be Aireen's priority, where she will be spearheading the non-airline companies such as BIGPay, BIG Loyalty, ROKKI Shoppe, ROKKI Portal, Travel360, Vidi, RedTix, AirAsiaGo, BD4H, RedCargo, Red Box and Santan. Additionally, Aireen will oversee large, strategic group-wide initiatives and help transform AirAsia into a global, cloud-driven product and platform company. Aireen will be responsible for AirAsia's digital strategy, promoting innovation throughout the group and encouraging collaboration across AirAsia's businesses and markets. Captain Adrian started his career as cabin crew with Malaysia Airlines. He joined AirAsia in 1996, when the airline was still owned by Hicom Holdings Berhad. He has served AirAsia in various positions including instructor and Company Check Airman, Assistant Chief Pilot – Training and Standars, and Assistant Chief Pilot –Operations. He was also closely involved in setting up AirAsia Thailand's flight operations and pilot training. In 2006, he was made Regional Head of Flight Operations. He assumed the Group Firector of Flight Operations position on 2nd January 2015 with overall responsibility for the safe and efficient operation of AirAsia aircraft by overseeing pilot recruitment, training and operations as well as cabin crew, ensuring compliance with national and international regulatory requirements and procedures.